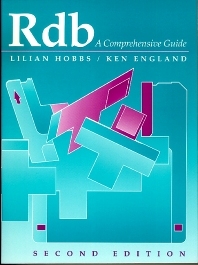 The definitive book on Oracle's Rdb database. Written by a team of bestselling database experts, including a principal product architect, this is unquestionably the definitive book on Oracle's Rdb8, the latest version of the powerful database for advanced enterprise applications. Rdb: A Comprehensive Guide, Third Edition teaches administrators, programmers, database designers and IT managers the critical components and functions of the new version 8 and explains how to develop powerful Rdb8 programs. The book specifically addresses new Rdb8 management, tuning and scalability tools and describes the new Rdb/NT Workbench for Windows NT. No other source gives readers the authoritative and timely information provided by Rdb: A Comprehensive Guide, Third Edition. Lilian Hobbs is a member of the Oracle Corporation New England Development Centre living in the UK. During the day she works on Oracle databases, but when she isn't writing books, Lilian is a keen astronomer and mountain bike rider. To find out more about this author you can visit her Web site at home.clara.net/lmhobbs. Lilian is the author of the following Made Simple books: Designing Internet Home Pages; Windows NT. Also, she is the author of the following Digital Press Books: RdB: A Comprehensive Guide; Digital's CDD/Repository (with Ken England); Oracle8i Data Warehousing. Senior Principal Product Manager in Oracle's New England Development Center. Ian Smith is a Consulting Member in Oracle's Data Server Division at its New England Development Center. Ian Smith is the lead engineer and principal architect for the Oracle Rdb database system. He has designed, developed, and implemented Rdb for over fourteen years and is a leading authority on the product.